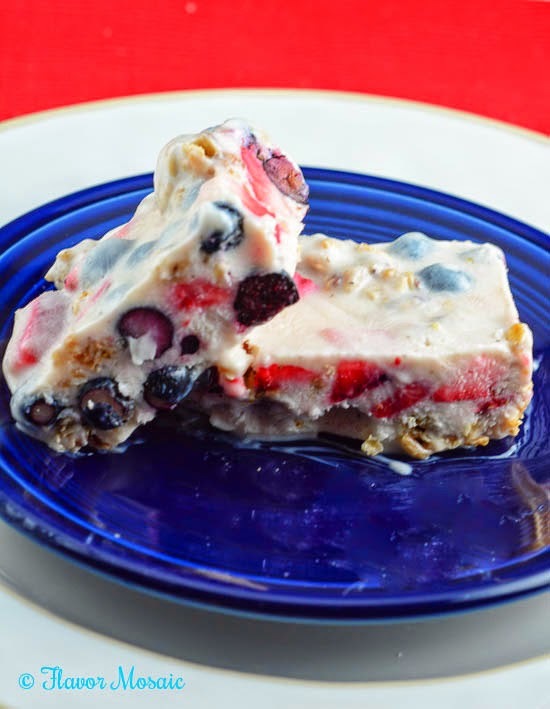 Red, White, and Blue Frozen Yogurt Bars are super easy, healthy, make ahead frozen desserts that are perfect for summer and for your whole family. Thank you Renee! Hi, I'm Michele from Flavor Mosaic. I'm so happy Renee asked me to share one of my favorite healthy recipes with you. 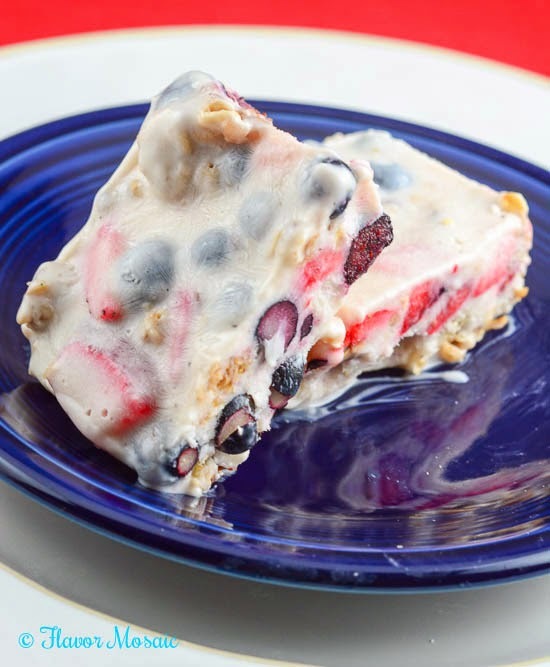 While Renee is away I'm going to play on her blog and share these beautiful, healthy, easy and delicious Red, White, and Blue Frozen Yogurt Bars made with Greek yogurt, strawberries, blueberries and granola. Yes. I know July 4th was a few days ago, but why not keep celebrating!? Actually these make a great healthy snack or dessert any time of year. You can change out the fruit to any of your favorite fruit. Another great thing about this dessert is that it is so easy the kids can help you make it. All you do is mix together Greek yogurt, sugar (if desired), a little lemon juice, and chopped strawberries, blueberries, and your favorite granola. That's it. Easy! You can use store bought granola or make your own. I recommend Renee's Maple Walnut Granola recipe posted on my blog. (Yes. It was her guest post on my blog.) I used plain, non fat Greek yogurt and added the sugar so I can control the amount of sugar. However, you can use flavored yogurt and either reduce or eliminate the sugar. Instead of regular sugar or Splenda, I use a natural sugar substitute called Whey Low, which I (and Mr Flavor Mosaic) think tastes exactly like sugar but with 75% fewer calories. We don't want the calories of sugar but don't like the other sugar substitutes. However, we both like Whey Low. My Mother-in-law is diabetic and I can safely use the Whey Low for Diabetics and not spike her blood sugar. Best of all, she can't tell that is not regular sugar. Win-Win. The downside to Whey Low is that it can be hard to find. It is sold in some Whole Foods Markets (but not all). It can, however, be ordered online at Amazon.com, which is what I do. What type fruit and what type of granola will you use in your Frozen Yogurt Bars? 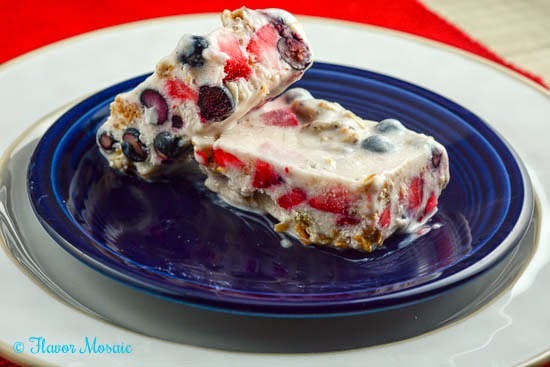 Red White and Blue Frozen Yogurt Bars are super easy, healthy, make ahead frozen desserts or snacks that are perfect for summer and for your whole family. Line an 8"x 8" pan with foil. In a large bowl stir together all the ingredients until all the fruit and granola are evenly distributed. Pour the yogurt mixture into the 8" x 8" lined pan and spread evenly. Place in the freezer for at least 8 hours or overnight. Remove from freezer about 5 to 10 minutes before serving. Thank you Renee for allowing me to guest post. If you liked this recipe, please visit my blog, Flavor Mosaic, for both healthy and unhealthy flavorful recipes. Please stay in touch by following me on Facebook, Twitter, Pinterest, and Google+. I love how easy these are to make, and I bet all that fruity goodness tastes great with the yogurt! Great idea!! Oh goodness, those look wonderful! I like how easy it is to prepare them! This recipe is just what the kids ordered! We all love them! I'm going to include a link to your recipe in my CSA newsletter this week! Yummy! yummm i'm makin these today!! thank u!